Over the past few months we have profiled a number of stairlift manufacturers on our blog, such as Acorn and Otolifts. 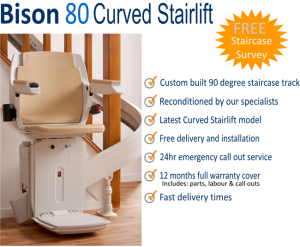 Within this blog post we will look at another well know stairlift manufacturer, Bison Stairlifts. 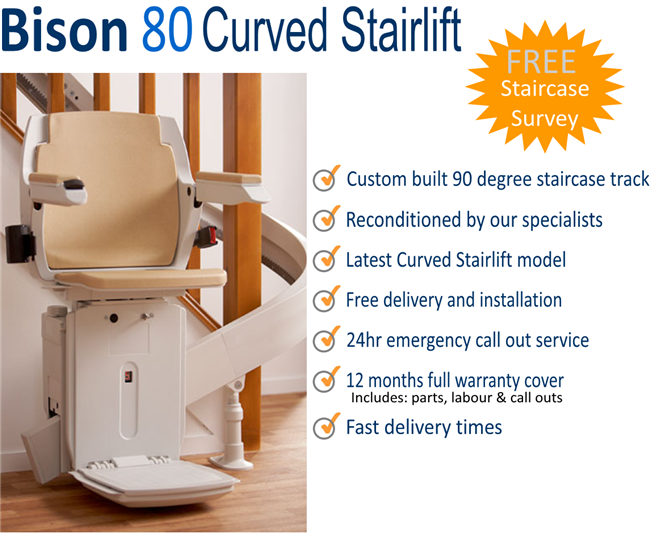 Bison is yet another stairlift company that had its worldwide origins in England. Bison stairlifts was established in 1981, when its founder realised that there was a market for stairlifts that were customised and tailored to the specific needs of the customer. Both their personal needs and the infrastructure of the clients house and staircase. Bison grew exponentially over the years which attracted the attention of Domus Homecara AG. Domus Homecare AG purchased Bison Stairlifts in 1998 which was a natural fit for its homecare businesses in Germany, Canada and Sweden. Distribution between 1998 and 2002 expanded to over 10 countries throughout the world, Bison were beginning to show export growth through their investment in product development, innovation and their go to market channel management. In 2002, management within Bison Stairlifts decided that customers would be better serviced and provided for by local stairlift companies and installers. Bison Stairlifts subsequently announced a ‘Dealer’ channel of authorised Bison Stairlift installers and maintenance companies. On the back of an investment in innovation and design of one million pounds in 2004, Bison announced a new Lift Style stairlift called the Bison 80. Also in that year, a management buyout of the company was successful and from there Bison Stairlifts grew to an extent where it attracted the attention of rival British stairlift company, Acorn Stairlifts. And so in 2008, Acorn Stairlifts acquired Bison. Acorn kept the Bison brand within its catalogue of stairlifts products, however it closed down the Bison Stairlifts manufacturing plant in 2009 and manufacturing was moved to the Acorn factory in Steeton, West Yorkshire. Bison Bede has been acquired and merged into Acorn Mobility Services Limited (Acorn Stairlifts). Acorn Stairlifts is a leading provider of Stairlifts across the UK. The Bison Stairlift brand remains to this day through Acorn Stairlifts and the Bison 80.